Do you love manicures that stand out, but can’t seem to nail the perfect finish at home? 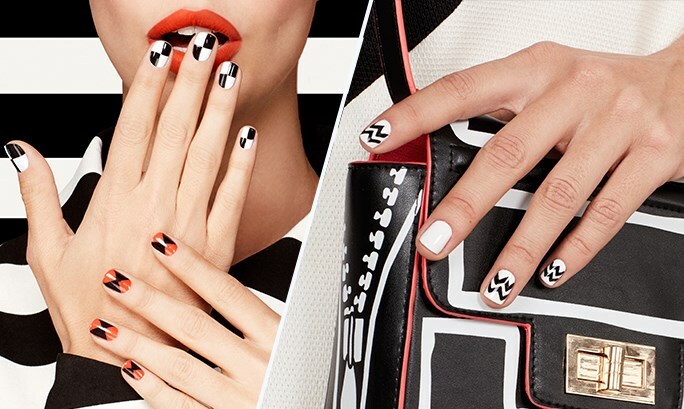 Then check out these six simple tips for salon-worthy graphic nails! This might seem self-explanatory, but too many of us jump into a nail art project without planning the execution before-hand. Know what pattern you want to create, plan all the steps in your head, and even watch a tutorial if needed. The quality of your nail polish will impact the end-result more than you think. Choose a polish with chip and fade resistant colour, like our The ONE Long Wear Nail Polishes, to avoid redoing your design every other day. A wide brush is good when you paint normal coats of nail polish, as it gives you a smoother finish. But when it comes to nail art, smaller is better. So cut an old brush with scissors to make it smaller and easier to handle. Few of us have the artistic ability (or the hand-eye coordination) to create intricate designs without guidance. Tape can be used in a million ways to create the patterns you want. Our favourites are to use multiple layers of tape, or to cut it with an arts and crafts scissor to get the perfect jagged edge. No one’s a pro straight away, so expect a few mishaps if you’re new to this. But that’s why they invented nail polish remover, right?! A good tip to avoid ruining your entire design, is to clean your edges with a cotton swab (preferably a pointed one, designed for makeup) dipped in remover. Way less messy! The perhaps most neglected (or forgotten) stage of the nail art process is the top coat. Sealing your beautiful creation with a durable top coat will help the design last longer.